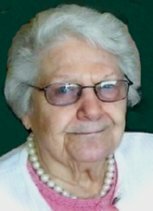 Norma M. Borwig, 94, of Waterloo, Iowa, died Thursday, January 2, at Ravenwood Nursing and Rehab Center. She was born September 28, 1920, in Waterloo, the daughter of Walter Bartlett and Ruby Corter Bartlett. She married Tony Emil Borwig on July 30, 1946, in Waterloo. Survivors include: her husband, Tony of Waterloo; two sons, Tony (Gayle) Borwig of Knoxville and Gary (Marcia) Borwig of Dike; five grandchildren, nine great-grandchildren, and four great-great grandchildren; a sister, Genevieve Borwig of Waterloo. Preceded in death by: two sisters, Constance DeLapp and Vera Stark. Private Services: Friday, January 9, at Hagarty-Waychoff-Grarup Funeral Service on West Ridgeway with burial in Memorial Park Cemetery. Public visitation from 4-7 P.M. Thursday at the funeral home.